In the early beginning of paleoanthropology the main question was quite simple: is there a fossil record which proves the existence of our ancestors from ancient times? The protagonists of paleoanthropology soon recognized the need for a sophisticated empirical approach. The best basis for such a development existed in France, where Pierre Marcelin Boule (1861-1942), a qualified geologist, paleontologist, and archeologist, unified in persona all necessary attributes to establish a paleoanthropology. His classical processing of the Neandertal skeletons from La Chapelle-aux-Saints (Boule 1911-1913) became a landmark in the history of human paleontology (Heberer 1955a). He aimed to understand the patterns of variation and the significance of anatomical differences. For this reason, Boule invented special instruments for quantification(s) and simple statistical concepts to analyze the variation in human skeletons (Boule 1921, 1923; Boule and Vallois 1946, 1952). Boule established a paleontology of humans, later on called paleoanthropology, as a scientific discipline, but as evolution in itself was still regarded as a widely speculative myth, the debate on human evolution "... rose and fell like a tide in France, Germany, England, and the United States,'' as Trinkaus and Shipman (1993 p 154) described the situation. During the late nineteenth and the early twentieth century, the overestima-tion of quantifying procedures strongly affected the anthropological research, starting with the first representatives of anthropological chairs, Jena Louis Armand de Quatrefages de Breau (1855, Paris) and Marcelin Boule (1867, Paris), and Johannes Ranke (1886, Munich) and Felix v. Luschan (1900, Berlin). While Ranke was deeply opposed to the idea of human evolution, with Otto Schwalbe, just mentioned, Theodor Mollison (München), Felix v. Luschan (Berlin), Rudolf Martin (München), and Otto Schlaginhaufen (Zürich) successively advocated measuring techniques of every conceivable kind (Keller 1995; Chaoui 2004; Junker 2004; Hoßfeld 2005b). While Schwalbe was convinced that information on evolutionary history could only be gained from neo- and paleozoology, others focused predominantly on typological classification of prehistorical populations and neglected broader paleoanthropological questions. This can only be understood by the fact that the conventional wisdom of that time was that modern ''races'' arose from types that were already separate in the early Pleistocene. 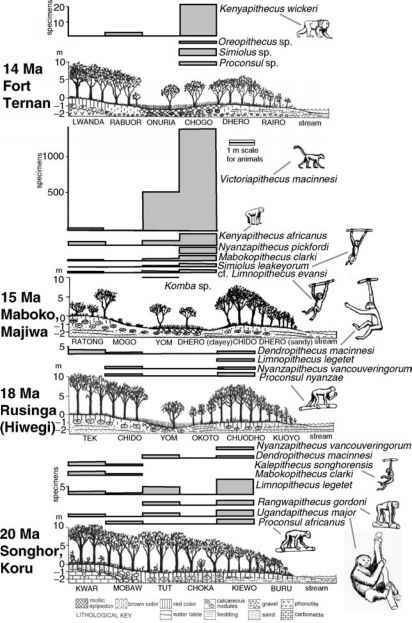 For this reason, there was a big problem when Gorjanovic-Kramberger (1906) described the fossils from Krapina, excavated in 1899-1905, in a voluminous monograph as belonging to a ''man-eating'' population (Radovcic et al. 1988). As this thesis was accepted by one of the most outstanding anthropologists at those times, Alec Hrdlicka (Prague, later on Washington) who pushed paleoanthropo-logical research using his influential position at the Smithsonian Institution, Krapina became a big challenge to the scientific community (Henke 2006). Further controversies were born when descriptions of the Upper Paleolithic skeletons from, e.g., Chancelade, Grimaldi, Combe Capelle, Oberkassel, and the Neanderthals, as well as, e.g., Le Moustier, La Chapelle-aux-Saints, La Ferrassie, La Quina were excavated and published. There was special interest in the mandible from Mauer that was described in 1908 by Otto Schoettensack (1850-1912) as Homo heidelbergensis (Adam 1997; Wagner and Beinhauer 1997). In England, the motherland of Darwinism, there was for a longtime little progress in paleoanthropology as the Darwinists were obviously ''no Darwinians in the modern sense'' (Bowler 2001 p 14). During the period from 1860 to 1940, a Darwinian style of explanation began to replace non-Darwinian developmental models stepwise, but a real breakthrough or turnover did not occur before World War II, largely due to the overwhelming influence of the paleontologist and geologist Arthur Smith Woodward and the zoologist Sir Arthur Keith as the leading authorities on human remains. Keith published An Introduction to the Study of Anthropoid Apes in 1896, followed by a monograph, The Antiquity of Man, which appeared in 1915. This publication on all-important fossil human remains founded his worldwide reputation and appeared in an enlarged edition in 1925. As can be seen from his textbook Concerning Man's Origin (Keith 1927), he was at that time less convinced than he had been 10 years before that modern humans and extinct ''primitive'' types had lived contemporarily. In his volume New Discoveries, Keith (1931) rejected this interpretation given the strength of the arguments for an evolutionary branching of hominins. From the viewpoint of history of science, we have to ask why the leading ''anthropologist'' as well as his compatriot Sir Grafton Elliot-Smith (1871-1937) retained this view for such a long period, in the face of compelling arguments to the contrary from paleoanthropological discoveries in Europe, Asia, and after 1925 in South Africa too. One plausible explanation is that theories are the filters through which facts are interpreted as Popper (1959b) said. The reason why the English authorities adhered to wrong models combines the fatal misinterpretation of the Piltdown hoax with wishful thinking and cultural bias (Spencer 1990a). The background of the Piltdown man forgery has been analyzed and described in many ways (Spencer 1990a, b). The most plausible explanation why the Eoanthropus dawsoni hoax was so successful is that it seemed to provide proof for a missing link between apes and humans, using a mix of plesio- and apomorph characters. Especially, the primitive jaw and dentition made Eoanthropus a more suitable intermediate candidate than Pithecanthropus. Even after the discovery of Australopithecus at Taung in 1924 and the excavation of the first Sinanthropus skull from Zhoukoudian (Chou-kou-tien) shortly thereafter, Keith (1931) hypothesized that the Piltdown type arose from the main ancestral stem of modern humanity. At that time, prominent British anthropologists, such as Smith Woodward, Keith, and Elliot Smith, were fixed on a European origin of humankind and were absolutely in opposition to models of Asian and African origin. The expected phylogenetic sequence was that the cerebralization antedated the changes of the viscerocranium. As the plesiomorph jaw and the apomorph brain of Eoanthropus complied with this expectation, it fitted perfectly into a scheme that was in fact wrong. To the extent that these and other indications for an extra-European "cradle of humankind'' were deliberately ignored, the Piltdown case is a telling example of cut and dried opinions. Small wonder that the scientific output ofpaleoanthropology during the first decades of the last century was very heterogeneous and confusing and more redolent of stagnation than progress. The evolutionary biology at those times was characterized by Mayr as ''chaotic'' (Tattersall 2000a p 2). First, even at the beginning of the twentieth century, Darwin's principles were widely misunderstood by anthropologists, who persisted in orthogenetic biological thinking or insisted on the theoretical split between natural sciences and humanities. Paleoanthropological theory and methodology were still in statu nascendi, judging from the literature of the time (Klaatsch 1899; Hrdlicka 1914; Werth 1921; Weinert 1928; Wiegers 1928; Abel 1931; Hooton 1931; Keith 1931; Le Gros Clark 1934). Second, the rediscovery of Mendel's work in 1900 demonstrated that new hereditary variation, i.e., mutation, occurs in every generation and every trait of an organism. The founding of genetics at the beginning of the twentieth century gave tremendous support to Darwin's theory and removed the objections to his postulates. However, the effects of genetics and population genetics were felt less in paleoanthropology than in the biology of recent populations, and especially in aberrations like typological social biology, ethnogeny, and race typology. In Germany, social Darwinism and fatal concepts of hereditary and race dominated biological and medical research on living people. Paleoanthropology was of only minor interest, while the aim of anthropology was defined in the National Socialist area or ''The Third Reich'' ''... der deutschen Volksgemeinschaft zu dienen'' (Reche 1937; see further Zmarzlik 1969; Gould 1983; Muller-Hill 1988; Seidler and Rett 1988; Weingart et al. 1988; Zangl-Kumpf 1992; Hofifeld and Junker 2003; Junker 2004; Hofifeld 2005a, b). Third, various approaches to explain the process of hominization later on turned out to be politically highly incorrect: e.g., Kollmann created in 1885 the term ''neoteny'' suggesting that humans evolved from pygmies who had simply retained juvenile features during size increase (Kollmann 1902). The basic idea was that pygmy progenitors probably arose from juvenile apes that had lost the ancestral tendency to regress. Bolk (1926) argued in a long series of papers that man evolved by retaining the juvenile features of his ancestors. His ''fetalisation hypothesis'' influenced evolutionary thinking on human origins and formed expectations of the appearance of transitional species. Bolk's theory was highly criticized and later on rejected by Starck (1962) because it was built on flawed arguments and a misinterpretation of Darwin's principles. Actually similar questions still resound in the current so-called evo-devo-discussion, e.g., the evidence overwhelmingly suggests that neoteny, the retention of juvenile characteristics, was one of the most important processes involved in the origin of H. sapiens (Mingh-Purvis and McNamara 2002; Chapter 3 of this volume). Fourth, the discovery of numerous Neanderthal skeletons (O Table 1.1) caused new arguments in the discussion of gradualism versus continuity. Boule's monograph evicted the Neanderthals from our family tree, although some outstanding early twentieth-century paleoanthropologists, like Alec Hrdlicka, argued for gradualism, a controversy that continues to this day (see later). Finally, the non-European fossils from, e.g., Java, China, and South Africa could have been a strong stimulus for a wider view of human origins, but the prejudice of the leading British scientists crushed innovative hypotheses, and the critical skepticism on non-European roots of humankind due to eurocentristic perspectives and the fatal misinterpretation of the Piltdown man resulted in a stagnation of paleoanthropological theories (Dennell 2001). For this reason, the period after Darwin till 1930 could aptly be named—as Dennell (2001 p 52) comments— the "Age of Prejudices'' as European (and North American) perceptions of nonwhites is concerned. The same author goes on to say: "... it is depressing to realize how much of what was written on human origins before WWII was little more than prejudice masquerading as science, it is impossible to understand the study of human origins without reference to these prejudices'' (Dennell 2001 p 51). The reader is strongly recommended to read Dennell's review (see also HoSfeld 2005b).